Our awesome birthday parties are 90 minutes long and accessorized with a karaoke machine for kids to sing along with their favorite songs. All parties are led by our “Pink Starlets” so parents can focus on enjoying their children having fun and taking pictures if you choose. Please call for details and reservations. Types of Parties we offer! Diva Parties: Diva Parties are for girls aged 4 and up! Divas will enter our exciting LaDeDa Spa, and adorn spa robes. They’ll then be pampered with Diva Hair, “pretend” Makeup, and Nails – and be transformed into a Darling Diva! Afterwards, they’ll head to the Karaoke machine for fun singing and dancing – and then its time for Glitter Tattoos! Finally after gifts, we’ll take an Awesome Keepsake Photo and autograph it for the Birthday Girl! $150 for up to 6 attendees, $200 up to 8, and $250 up to 10 attendees (Note: If your guest list makes the group greater than 8 Friday evening and the late time on Saturdays can accommodate 9 to 10.) A $50 deposit schedules your party and will be deducted from your total when the balance is paid. Diva Day Mini Makeovers: Don’t forget – we also do Diva Day Mini Makeovers for individuals or just a special occasion! Small groups: $21.95 each! Who are those Pink Starlets? We have a group of high school and college aged girls who work for us specifically hosting our Birthday Parties, doing Diva Day Makeovers and helping bring fun to sporting events, carnivals, parties and more! These ladies wear Shocking Pink wigs and aprons so they stand out in a crowd. Our Pink Starlets will put the FUN in your function! Please note: Our Pink Starlets may not be available for certain events, but please call us for more details! A $50 deposit is required to reserve your desired birthday party day and time. The deposit is deducted from your balance the day of your child’s party. We’d love to help make your child’s birthday a special day with his or her friends. 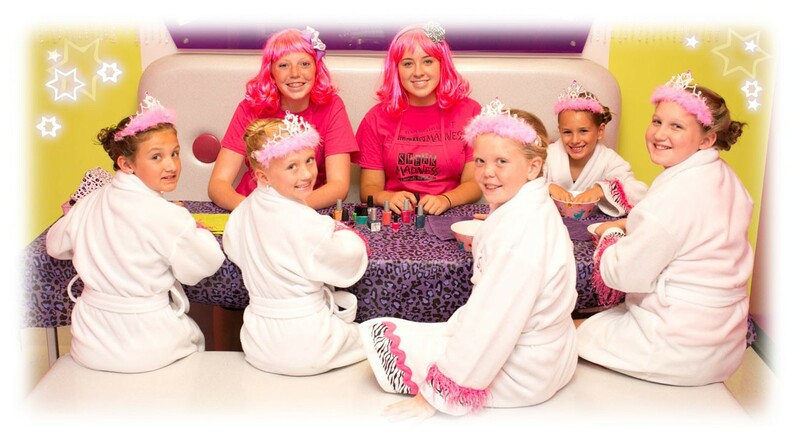 To book your DIVA birthday party please call 816-347-1920! A note on cancellations: Rarely do we have party cancellations, HOWEVER if you must re-schedule or cancel your party reservation you MUST do so no later than 10 days prior to your reservation – or you will lose your deposit. If you have any questions please contact your location for details.